Teaching 5-year-olds about money sounds crazy. They can barely go potty by themselves — what could they possibly need to know about money? If you want to raise a future Penny Hoarder, though… It’s never too early to start teaching financial literacy for kids. Which is why we’ve decided to lay out what your 5-year-old should know about money, as well as some kid-friendly ways to teach them. The first four concepts are straight from Money As You Grow, a helpful resource created by the President’s Advisory Council on Financial Capability, and the last tip is a special one for Penny Hoarders. What is money? What do you use it for? Money concepts that may seem basic and obvious to you are probably baffling to your child. For starters, let your child physically interact with money. Teach them the names of coins and small bills, then use them to practice counting. Whenever you purchase a low-cost item — like a new pair of socks, a book or a cookie — talk about how much money it costs. Then, count out that amount of money together. Playing “store” (one of my personal favorites!) is another great way to drive this concept home. Clearly, it’s not only important to help your child understand what money is, but also where it comes from. You don’t want them thinking there’s some magic money tree or machine. Explain to your child the only way to earn money is by working hard. Point out different jobs they can have when they grow up, and explain what you do at your job. Tell them you work every day so you can buy food, clothes and other items that keep your family happy and healthy. Don’t forget to tell your child they also have a job: to do well in school. You don’t need to correlate good grades with higher earnings yet; just explain that everyone has a job, and for kids, that job is to pay attention and do their best in school. It can be difficult to teach kids to distinguish wants from needs — after all, it’s something many adults still can’t or don’t want to grasp! One fun way to illustrate this is by having your child make a drawing with two circles: one for wants and one for needs. They can draw different items within each circle, and you can talk about why each one is a want or a need. Another great opportunity? Going to the grocery store. By making the battle over cookies vs. cucumbers into a game, you can hopefully make your trips both bearable and educational. This is where an allowance — regardless of how small it is — or an entrepreneurial venture, like a lemonade stand, can be effective in building financial literacy for kids. With your child, pick an item out of the “want” side of their illustration, and talk about how they’re going to save for it. Make sure it’s something small and achievable, like a set of markers or a stuffed animal. After you’ve figured out how they’re going to save for their purchase, get them a clear jar so they can see their money growing week after week. Help your kids develop a savings habit early in life, and hopefully it’ll be less of a struggle for them as they grow older. This one is a special tip just for Penny Hoarders; since we know you love saving money, we want your kids to enjoy it, too. An easy way to do this? Clip coupons together! Look through the circulars and ask your child to point out items you normally buy. Get them even more involved in the process by letting them clip, carry and hand the coupons to the cashier. If you’d like, you can take it a step further and give them whatever money you save with their coupons — that’s a surefire way to motivate them into bargain hunting! Even if you don’t want to teach your child any of these specific concepts, just make sure you start talking about money. The worst thing you can do is avoid the subject completely. You may not be as good with money as you’d like (newsflash: None of us are), but by equipping your child with basic financial knowledge, you’ll set them up for a bright future. Here’s to your future Penny Hoarders! 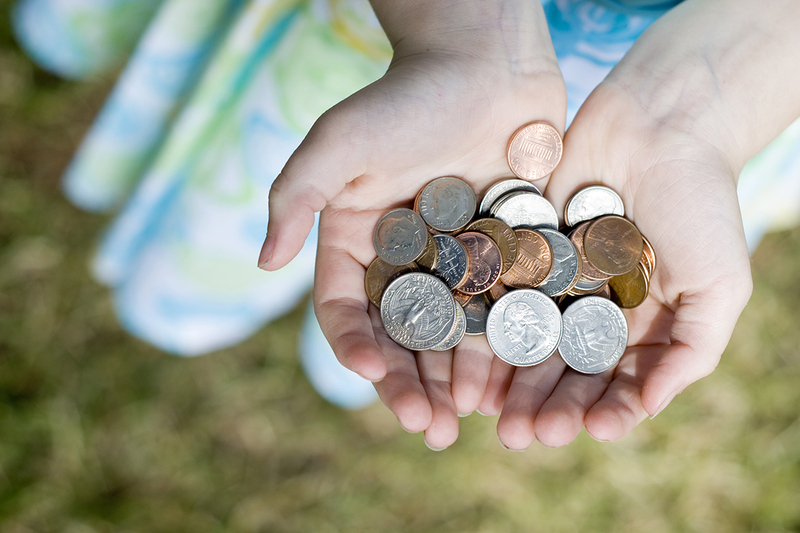 Your Turn: Have you started teaching your kids about money?